This week is the second one for our DRC Appeal which was launched under the Light projects. The first appeal was about Conflict Victims while this one is about Flood Victims. Before dealing with this week’s appeal (Flood Victims), let’s highlight other matters trending at CENFACSSPHERE and making this week’s contents as well. They include: the ends of this year’s Gifts of Peace and Responsible Consumption campaigns, and Unwanted Festive Gifts. Our Gifts of Peace campaign ends today. However, as there is always a life who desperately needs support we will continue to accept any giving made beyond the deadline of 31/01/2018. We would like to thank you all for your Gifts and for making our Season of Peace to happen. Our January month of Responsible Consumption ends today as well. However, our resource on Consume to Reduce Poverty (CRP) and Climate Change is still available for you from CENFACS depository and e-Shop. Likewise, our CRP advisory and advocacy project is still running. Again CENFACS would like to thank you for your support about Responsible Consumption and for being responsible consumers yourselves. UNWANTED FESTIVE GIFTS: Recycle Them! Some of you may have received gifts over the festive period. If you decide you don’t want or need them, we wonder if you could consider CENFACS Charity e-Shop for donation of your Unwanted Festive Gifts. Our Charity e-Shop is ready to receive your Unwanted Festive Gifts that you may have received over the festive time and you don’t want or need them. You can donate your Unwanted Festive Gifts to CENFACS to help raise the money for the deserving causes of poverty relief. Donating Unwanted Gifts or goods is also an opportunity or alternative way to recycle those goods you have received or bought that they are no longer needed. Last week, we appealed to you to Light a Blaze of Hope for the Conflict Victims in the DRC. We thank you for your response. As the DRC Appeal is within a series of appeals under our Light Projects, this week is the second part of DRC Appeal. So, our Light Projects to deal with the complex humanitarian situation in DRC continue this week. This time is about Lighting a Blaze of Hope for the Flood Victims there. Since 2017 until this January, DRC has been badly flooded particularly in the North Kivu and Kinshasa to name just two of the flooded areas there. According to local sources, Kinshasa experienced records of 182 mm of rain in a 24 hour spell. As a result, there have been a great number of homes swiped by heavy rains, collapsing walls and landslides, exacerbation of diseases with 55000 cases recorded of cholera and 1190 deaths from cholera. Adding to this pitiable picture, there are poor sanitation and lack of access to safe drinking water, poor infrastructure and flooded roads with rainfall etc. The number of deaths from flooding continues to increase. This difficult environmental health situation is happening at the time when the same country is confronted with armed conflicts over its democratic transition processes. The conflicting situation has already made the local Congolese people to pay a heavy price. According the same local sources, about 10.5 million people are bound to be in distress this 2018; 1.7 million of people were internally displaced; dozens of mass graves were found in conflict-stricken villages etc. In addition to this appalling situation, a high number of human rights abuses was accounted from the sides of the rebels, government forces and state-linked militia (called Bana Mura), as well as extreme violence by militia groups and government forces. Despite these alarming conditions, only half of funding appeal was received; meaning that the rest has not yet being released. Whatever the causes or reasons (such as flooding and or conflict or other types of events) of the crisis there, it makes sense that the international development community that we make up acts and supports NOW, NOT LATER! This is why the Light Projects exist at CENFACS. The Light Projects are not just about appealing for funding although there is a say that “Money is King”. Light Projects are also and more about making the mechanics of the international development system and the development community to do something about difficult conditions poor local people can be caught in. Things such as talking to someone who has influence or power on what is happening on the ground can change life; just as networking, campaigning, responding to a petition etc. can make a significant impact. A telephone call or a mobile phone text message or even a tweet can save millions of lives. These kinds of simple things that one can do matter a lot for those whose life is at risk. It is not surprising if Wangari Maathai said that “It is the little things citizens do that is what will make the difference” (Wangari Maathai, Environmental Activist and Nobel Peace Prize Winner). CENFACS’ little thing is to assemble resources and make this appeal. We are now asking you to do your little thing, if you can, to make helpful difference to the life of the Flood Victims in the DRC. Our appeal is all about going beyond the big picture of humanitarian relief aid and military intervention by doing little things such as Bringing and Lighting a Blaze of Hope for those who are in a desperate situation and have a pressing need there. Briefly, because of the greater need arisen from the current grave situation in the DRC, CENFACS is appealing to the world of peace, to you to support its Wintry call of LIGHTING A BLAZE OF HOPE FOR THE FLOOD VICTIMS IN DRC. 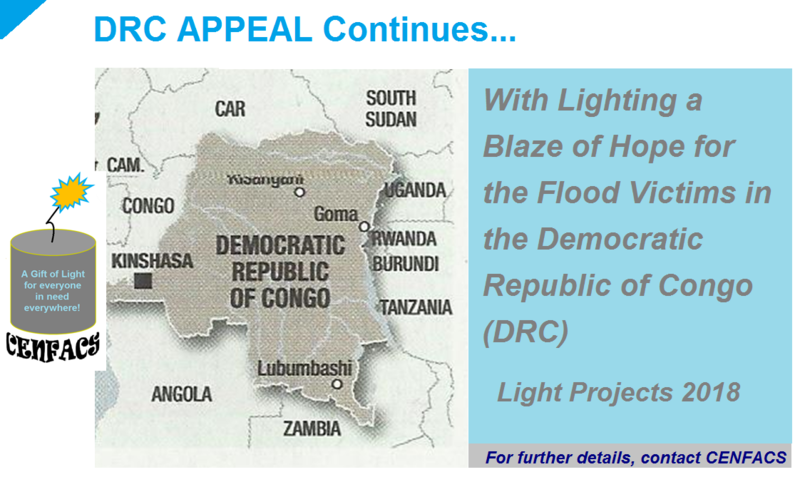 To support this appeal and the Flood Victims in DRC or to enquiry about the Light Projects, contact CENFACS. We look forward to receiving your regular visits and continuing support in 2018.